Justin Floms path to crafting his own unique brand of magic has taken a circuitous route from his home town of Eden Prairie, Minnesota to Branson, Missouri to the SyFy Channel to some of the largest arenas in the country to being one of the first magicians to focus on social media on his way to becoming one of Americas most sought-after magicians  surpassing entertaining 100,000,000 fans in 2015. What sets Justin Flom apart from most other magicians is the simplicity of his magic and the fact that he cracked the code on doing close-up magic on giant stages. He holds the distinction of being the first magician ever to perform card tricks for a sold out crowd at the fabled Madison Square Garden. Scott Flom is magic. 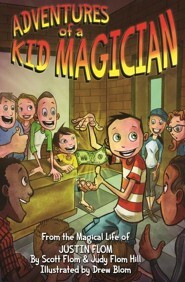 Not because he's a magician, but because he's found time to nurture his passion for magic all while being a successful salesman, entrepreneur, husband, and father. Scott was fifteen years old when he began practicing simple magic tricks with his older brother, Larry. Soon this hobby became a way of life as Larry used magic in his job as a history teacher and Scott and his career as a salesman. Using his creative skills and building relationships, Scott was soon one of the top salesman for his company nationally. 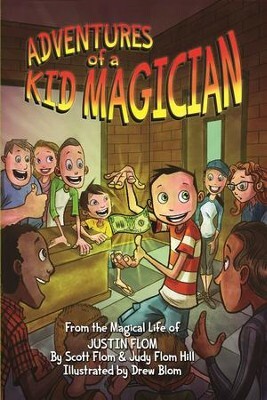 As Scott and his wife Lisa began raising a family, each child was taught life lessons through magic and variety arts. People would visit from all over the country to spend time at the Flom house, as you never knew what would unicycle or juggle by the dinner table. He built his home with secret passageways, talking wall fixtures, and even a bowling alley. Scott is still a top salesman, he is still building magic into his home, and he still sharing life lessons through magic. He would tell you his whole life has been an amazing magical adventure. As he often says, "God promises to give you more than you can imagine, and I have a great imagination!" Judy Flom-Hill is the proud aunt and godmother of Justin, and she has marveled at his magical prowess from the time he was two years old and starring in his family's magic productions. Her older brother, Larry, and her younger brother, Scott, awed her with their amazing feats of magic, the secrets of which they never divulged. Justin is now the third generation of Flom men to amaze and delight. She is the author of two suspense novels under the name of Judith Shoemaker-Hill. Writing Lady Lazarus and Know Thine Enemy was an exhilarating experience, but collaborating with her brother and nephew was a new and wonderful literary joyride. Hopefully you will have as much fun reading these adventures as they had creating them. Drew Blom is an illustrator, designer, and art director. He specializes in children's books, comics, and graphic novels, illustrative logo design, and caricature. His work has been published in over a dozen books, and has been featured in Venture Beat and The Washington Post. Drew currently lives in Minneapolis with his wife, Liz, and their three children. I'm the author/artist and I want to review Adventures of a Kid Magician: From the Magical Life of Justin Flom - eBook.